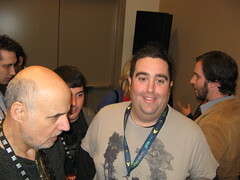 Posted on March 10, 2008 by Greg C.
Yesterday was a really exciting day at SXSW. We saw some movie stars, AOL won a prestigious web award, and we took on a bunch of other geeks in a ho-down at the bowling alley. A few years ago, Arrested Development was my favorite show on TV (old episodes can be found on hulu.com), and without a doubt that show launched the career of Michael Cera from Superbad and Juno, and it also reinforced the fact that Jeffery Tambour was one of the best comedic actors around. Today he was at SXSW and it was very cool to meet him. This evening, Kevin Lawver‘s Ficlets which was nominated for two web awards at SXSW, won the award for site with best CSS. Congrats to Kevin and all the folks who worked on it. For those who do not know, Ficlets is a community short story fiction writing site where stories can be strung together and shared with others. 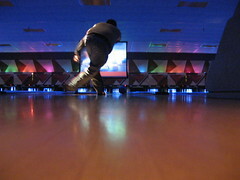 As the web awards were going on, the Open AIM group here attending the conference went to Bowling For Geeks. In a competition between 50 teams bowling two games each, we came in toward the bottom, but had a lot of fun. The folks here in Austin have been awesome this year in getting out and supporting a lot of causes and organizations (of course free food and drinks never hurt).